This book is weird. The climax features a one-sided snowball fight. And it’s about a time-traveling serial killer. It’s weird. It’s also not very good. The Shining Girls is a book of parts, and some parts work, some parts don’t. Each chapter focuses on a person and a time. Harper, the time-traveling serial killer, spends most of his chapters in the Great Depression Era, plotting escapades to the future to kill “shining girls.” The other main character is Kirby, a shining girl from the early 90s who survives Harper’s homicide attempt. She partners with Dan—a loveable Chicago Sun-Times reporter who was my favorite character—to catch her killer. If a chapter title read Kirby 24 June 1992, I would read with gusto. If a chapter title read Harper 18 January 1932, I’d groan and settle in for an unenjoyable chapter. It’s problematic when you don’t want to read any of the antagonist’s boring, tedious, and repetitive chapters since they amount to more than half the book. I picked this book up after hearing the phrase “time traveling serial killer.” But Lauren Beukes doesn’t sufficiently develop either of these ideas. The time travel seems like a gimmick. Harper finds a House with a Room full of objects and names of shining girls he will kill decades in the future. He can walk out of this House into a different time to hunt these women. I don’t really understand the House or the rules of time traveling here. Harper often loops his own narrative, hopping from a later time to an earlier time with seemingly no consequences. Structurally, the time traveling is difficult to follow. As I said, each chapter is headed with the character’s name and the date, but when I’m reading fast and the chapters are short, I lose track of “when” I am in the text. The intricacies of Harper’s sojourns back and forth through Chicago were lost on me. And since we jump from past to future, events are spoiled long before they ever happen. Beukes could have used this foreknowledge to create great dramatic irony and tension, but the way she used it only lessened my appreciation of the narrative. I knew what was going to happen, but I wasn’t pushed to fear what was going to happen. A linear narrative would not have worked for this story, but—if this makes any sense—I would have appreciated a more linear non-linear story. As a serial killer story, it fails as well. Why do I read murder novels? To (attempt to) understand a killer’s motivations. To admire the tenacity of a victim. Or to empathize with the devastation of a victim. To figure out whodunit. Yet all of that was absent here. For the excess of Harper chapters I suffered through, I still don’t understand him as a person. Unlike many popular serial killers, Harper is neither charming nor horrifying; he merely kills. Kirby is a likeable protagonist, but her motivation to find her killer is the most striking aspect of her character. Not much else defines her. And while this story is a mystery to Kirby, it is never a mystery to the reader who knows the killer and his secrets from the first page. 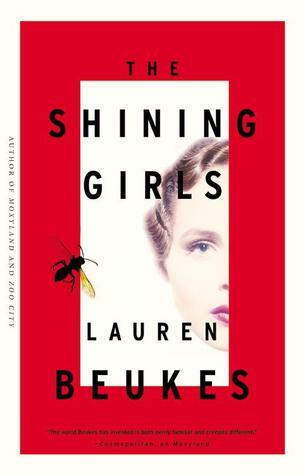 One thing that impressed me about The Shining Girls was Beukes’s research. Chicago is an important part of this novel. The time and characters may change, but Chicago remains constant. The research is impeccably detailed and thus, Chicago breathes with life. But as I’ve noticed with other historical novels, especially those set in bright American metropolises during sumptuous eras, the author can become indulgent with the depth of her research. There’s too much here. It’s too referential. Often it feels like a famous Chicago landmark is alluded to merely because the author had seen it in her research. And despite all the research, I’m surprised by the way the dates are written in the chapter headings. Perhaps it’s an editorial error, but the dates are written in the date/month/year format—e.g., 1 July 1989—even though this book is the American edition and it is set entirely in America. Even in the non-American editions, it would be more authentic to use our admittedly backward month/date/year format. Thematically, The Shining Girls shines a little brighter. Harper’s pursuit of “shining girls” is a good metaphor for the way a patriarchal society punishes girls with promise, wanting to push them back to their “proper” place. And the idea of a House that dictates who Harper will kill years into the future well represents the idea of a true psychopath. Once Harper finds the House, he appears to have no control over himself. Once a psychopath begins to kill, perhaps he has no control over himself. Harper was meant to kill, is meant to kill, will always be meant to kill. He is a killer in every iteration of time and space. I’ve written a lot about a book I didn’t really like. If you want Chicago and history and murders, read The Devil in the White City: Murder, Magic, and Madness at the Fair that Changed America by Erik Larson instead. 1. it happened in real life 2. it has Ferris Wheels.